All your airdrop needs in one place. What the pros use to chart. Scam coins to look out for. Make sure your answers are from someone qualified and take it with a grain of salt. One of the best, if not the best Bitcoin researcher. A good source of info for confirming various sources. Lots of friendly people reply quickly for such a small community. Just found about this one, better than CMC. Know your projects, inside and out. Track worldwide searches for evaluating market sentiment and interest. Market data and cap info. Free BTC widget for your site. Email alerts for price changes to coins. Use this for quick satoshi to USD conversions..
One of my go-to sites/apps for quick overviews and tracking coins. Check out my “moments” section for tweets I have been collecting from the pros. This whole section will educate and make you bullish on crypto. Also has trading/investing tips. 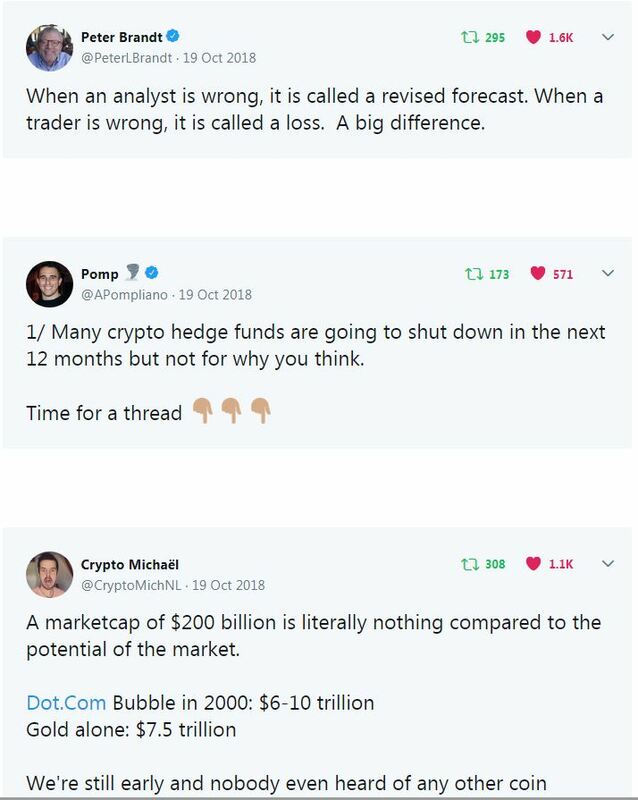 Specifically, tweets I send out are mainly about markets (crypto and traditional), economics, Bitcoin data/research, developments with the aforementioned projects, and a touch of motivational quotes, sports GIFs, poker tips/resources, and health articles. I try to keep it mainly crypto-related a vast majority of the time. Of course you know by now that I am never selling anything, period. It’s all data that people in the crypto space SHOULD know. I also tweet altcoin news/price movements of projects that I might be trading at the time. There is no way to post all those tweets here. For real-time updates on price, whale activity, sentiment, and market movements/news. Give me a follow and let me know what you think of the site! I am DYING to get some real feedback and those from my friends/family don’t count as they are biased. Haven’t gotten a single one, yet. Kind of demoralizing after two plus weeks and months of work. Help get the word out about this site which I put my heart and soul into over the past few months. I have invested a lot of time and effort into making this site, and a lot more money than I originally planned. Please support this website by sharing the content on this page as there are ZERO ads on this site to bring in revenue. You sharing this content across social media and on blogs/websites helps get the word out. I am relying on the referral links to help pay for some of the costs associated with running and maintaining this site. This site will be updated (almost daily) for the foreseeable future and sharing will do wonders for Google search rankings and increasing traffic to this site. I can’t really see myself not updating parts of this site at least once out of every two or three days as there is always breaking news and new promos/sources I will discover and want to share. Would love to hear what you’d like to see added, removed, or changed. I am considering making a personal blog section to record this journey of creating and running a website so that it may inspire some of you to take the next step to creating passive income streams, for yourself. Maybe you don’t want to build a crypto site but another area of interest. The planning and resources still apply regardless of the product or service you plan on utilizing. Or I could just start a blog on my journey earning free crypto but this will require a ton more time and effort as a ton of data will have to be compiled and recorded, then explained step by step. Anything is possible. I promise to do all I can to make this the BEST free resource for not only earning crypto for free, but also learning the basics of crypto and security. I also promise to take all constructive criticism seriously and make the necessary changes IF i believe this will improve the overall site. Contact me if I am missing a promo or news that you think should be added, too.